A Tummy Tuck procedure, medically termed an abdominoplasy, is a cosmetic surgery that enhances the contours of a patient's abdominal region by removing excess skin and fat from the stomach and tightening the muscles of the abdominal wall. Approximately 212,000 people underwent a Tummy Tuck procedure in 2009, a forty-two percent increase from the year before. Because of the relatively low risks of this procedure and its effectiveness at greatly enhancing body contour, Tummy Tuck procedure surgery is rapidly becoming a popular cosmetic procedure. The best candidates for a tummy tuck procedure are patients in good health who have a realistic understanding of what to expect before, during, and after the procedure including the risks and benefits of a Tummy Tuck procedure. Patients who plan to lose a lot of weight or those who plan to become pregnant in the future may wish to postpone a Tummy Tuck procedure, as these factors may compromise the results of a tummy tuck procedure. Patients who are planning to undergo a Tummy Tuck procedure should also speak to their surgeon about their full medical history, including all current medication and supplement use. A Tummy Tuck procedure is performed by our qualified and experienced plastic surgeon. Before the Tummy Tuck procedure it is very important to discuss the desired outcome of the surgery with our surgeon. In our Cosmetic Center, the medical professional will determine the extent of fat deposits and excess skin in a patient's abdominal region in order to determine what tummy tuck procedure is best. In some cases a mini-tummy tuck procedure is the optimal surgery to achieve a patient's desired results, while others would benefit most from a traditional Tummy Tuck procedure. During a tummy tuck procedure, a surgeon may choose to use a general or local anesthesia. A complete Tummy Tuck procedure takes about two to five hours. The Tummy Tuck procedure itself involves the surgeon making an incision vertically across the abdominal region and may also include an incision to free the navel for repositioning. With a mini Tummy Tuck procedure, the incision is relatively smaller and the navel may not be removed. 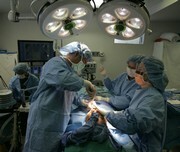 The surgeon will then remove the excess fat and skin from the abdominal region and tighten the abdominal muscles. After a Tummy Tuck procedure, a patient will typically experience some swelling, pain, and discomfort which can be managed with medication. Most patients recover significantly in the first weeks and months following a Tummy Tuck procedure. The final results of a Tummy Tuck procedure are generally seen after three or six months. The results are usually long lasting and very satisfying for Tummy Tuck procedure patients.